Darren Clarke has opted to “sit on the fence” and leave the likes of Rory McIlroy, Graeme McDowell, Shane Lowry or Pádraig Harrington to fight it out for Olympic gold in 2016. The International Golf Federation wants players to declare which country they’ll be available to represent in Rio. But Clarke has decided to pass, explaining: ”In 2016 I'll be 47 and I don't think I'll be making any team anyway, so it's fine! "So I will just, respectfully, sit on the fence. Darren Clarke might have kicked the Olympics to touch but that doesn’t mean he’s not proud of the Irish caps in the family — including football. 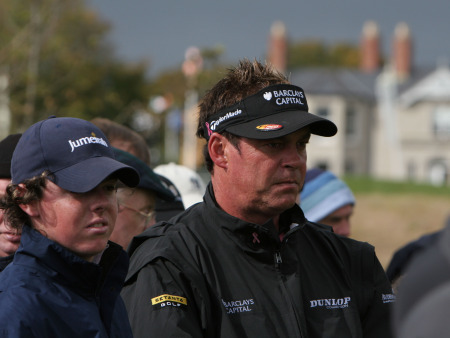 The 2011 Open champion won 16 Irish caps as an amateur golfer, which beat his grandad Ben Clarke, who was an amateur soccer international for an all Ireland team in 1934. Described as a right-back "admired for his sterling qualities and solid worth in the rear division,” grandad Clarke won two caps. He was on the side that lost 4-0 to England but then beat Scotland 4-1 and played for Portadown, Dungannon, Sheffield United, Exeter City and Carlisle United. Darren’s father Godfrey was no mean soccer player either, lining out for Glenavon in the Irish League. The high tech piece of kit has been ratified by the R&A to plot a player's precise round on a course using GPS technology and a 'tap-in' system on the end of each club. He can then see his practice round on the web after his game and see how he plotted his way around the course and how far he hit each club. The systems records tons of data including club distances, putts and greens in regulation. McDowell will end his trial when the tournament proper starts today but dream qualifier John Singleton is expected to use it in the tournament proper. Amateur golfers can pick one up for around €250. The R&A has installed Wifi for the fans at Hoylake. But just as they were boasting about the system in their annual media conference, the Wifi went down for over an hour for the scribblers in the media tent. it seems that a workman was digging a hole for a directional sign that said “Media Centre” and accidentally sliced right through some fibre optic cable, leaving the world’s press in limbo. The Open is a great gathering of world golf but it’s also a huge rumour mill. The latest bit of chat doing the rounds is that the PGA of America and the European Tour are hatching plans to stage a Senior Ryder Cup next year. Set to run over three days, there would be just 10 players on each side instead of 12 and the idea has gone down well. With the FedEx Cup series offering a free week between Deutsche Bank Championship and BMW championship, the golden oldies could get the chance to shine. A formal announcement could come as soon as next month's US PGA at Valhalla. Darren Clarke became the oldest winner of The Open since Roberto de Vicenzo in 1967 but the 42 year old credited Padraig Harrington as the man who “got the ball rolling” and set the Irish golfing revolution in motion. His closing 70 gave him a emotionally charged three-stroke win over Phil Mickelson and Dustin Johnson on a squally day at Royal St George’s and handed Ireland an incredible sixth victory from the last 17 majors. Harrington's major quest continues: "I have no intention of stopping"
Pádraig Harirngton has no intention of giving up his quest for more majors. 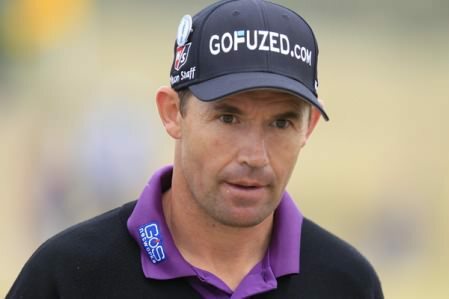 Picture Eoin Clarke www.golffile.ieRory McIlroy might have lost his world No 2 ranking to new Open champion Phil Mickelson but like Padraig Harrington and Graeme McDowell, the Holywood star will put his frustrations aside for a few weeks and come back for more in the US PGA next month. Rory quids in for The Open?